39, 41 regular driving and 39, 26 when I'm at the dragway. The tires are wearing evenly. Wow, those numbers are really high. I worry about high pressured tires being more prone to pick up debris and leading to flats. What is the recommended minimum pressure on the fuel door for C63? 36 all over. I pick up too much debris and nails if higher. Although the chart didn't paste well, I found this on TireRack. mph	km/h	psi	bar	% of value branded on sidewall	psi	lbs. 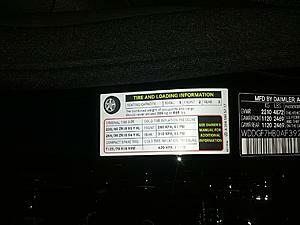 NOTES: Never exceed the maximum cold inflation pressure branded on the tire's sidewall. Tire pressure isn't just about speed but also load rating. Bottom line is you should stick close to what MB suggests as it takes into account weight, required load, etc. I;m curious as to how does a high pressure cause debris to be picked up? I would think a lower pressure would do this as the tread would "sag" and be more prone to debris. Bottom line though is there is a lot of personal opinion on this and very little is based on any real evidence or fact (including my opinion). Last edited by gthal; 11-18-2012 at 10:38 AM. Interesting phenomenon, isn't it?! However, it's actually well proven and you can find that info on many sites, books, and magazines. I'm also curious as to how exactly that works. If I remember correctly, it has to do with how the increased stiffness has a tendency to throw debris upward and also stand linear debris like nails on their ends, with the fraction of a second just long enough for rear tires to roll over them and cause punctures. I used to think a lower pressure would be less likely to pick up debris, too. I used to get a lot of flats (esp passenger side rear tire) in my old cars and came to found out my tire pressure meter caused me to overinflate. Then I got a digital Accutire one after reading Consumers Reports as well as a new set of tires and never had a flat since then. But the new tire model might have something to do with it. Last edited by otakki; 11-18-2012 at 07:25 PM. Tire pressure is 49. And fronts are like 43. But just one rare tire is 5-6 points higher than the rest.. Should I be concerned ? One tire shouldn't have that much higher pressure than the other three. I have a feeling the TPMS is going haywire and sending out erroneous signals. but it looks like this is for 225/45/18 all around M&S winter tires? Benz I'm finding likes em up. I run same DWS Conti on all my rigs (M3's, NSX's, X5is) and they all ran much lower but my C63 (low! On H&R and 19" rims 275/30) rubbed badly 35! Now I bumped to 41 front and 45 rear no rub and rides/handles fine. It's a street car not my race bikes where grip is key & 0.25psi is huge. No reason 41/45 or close is "too high"
I'm currently running 44psi all around. I used to have it lower in the front, but after some tough encounters with SF roads, I beefed it up. I'm also only running 245/30 up front. If I had a fatter tire, I wouldn't have to worry about dinging rims. On the stock Perelli P Zero 18" I ran a 38psi front and rear and my rear tires are worn in the middle only. Hmm weird. Maybe its the type of tire. Going with PSS next. My flap says 41/41 but the TPM thinks 39/39. I set the cold tires with an accurate gauge to 41 all around and recalibrated the TPM. It read 39/39. Very annoying. I had to drop the pressures to 39, reset the TPM and then bump them to 41. Not a big deal but stuff like that irritates me. My rears are wearing the same. I got @6k on the rears and now down to the wear bars, lol. Same thing happened to me on the Zeros but I'm getting more than twice the miles with half the wear on my PSS. Zeros in rear lasted 7k miles. Similar here. Bought mine in Jan 14. Brand new Michelin's all around. Last week with 9k miles I replaced the rears. Fronts look brand new. My rears were worn badly in the middle (indicates over inflation) I had been running 42 all around. However at operating temps the pressure jumps 5 to 7 lbs. I'm in Alabam wher ethe temps have been in the lower 90's. With my new rears I lowered to 37 in front and 39 in rear. Still at operating temp pressure jumps 5 to 7 lbs. So running at temp about 45 lbs in rear. Any opinion if that pressure will lead to the tread wearing out in the center from overinflation. I have a s55 AMG...with that said...i was running recommended 33 and 35. I find that way too low. You can see where the tire rolls on the sidewall wear due to corners and raising and lowering the car auto in sport. I find i get less wear with higher pressures but the ride is going to suffer a bit. I raised my pressure 6 psi above what was recommended and tire wear on outsides were reduced. Just my 2 cents. Thanks, now I can sleep at night. Whew! Great first post! About bloody time an S class owner checks in to help settle this. Buddy joined in June 2014, and the last post in this thread is August 2014. He was thinking about what he wanted his first post to be for a reaaaaaaaaaaaaally long time, and finally got it just right. Don't forget you're running low profile rubber, & with that low pressure, you are lessening the "cushioning" barrier that you need to protect your rims if you hit a rock or something.....you are more likely to suffer tyre damage which can then more easily transmit to the rim....I'd be going a MINIMUM of 38. Yeah I've got the 19" on my 507, if I ran at 34 I'd be replacing tires daily. I run 42 all around, but that's for DD. I haven't had any over-inflation issues on my PSS, which, amazingly, have lasted me a full year and about 20,000 despite my 'spirited' driving. Guess it's time for the new Mich PSS replacement tires though. Last edited by 507OverBiturbo; 12-24-2016 at 01:28 PM. Two different questions here: 1) What is the correct tire pressure for street? 2) What is the correct tire pressure for track? 1. While the label on the driver's door jamb shows 41/45 front/rear, the fuel filler door label shows that this is for 5 people and luggage. Under normal conditions, the figures are 39/39 front/rear. 2. 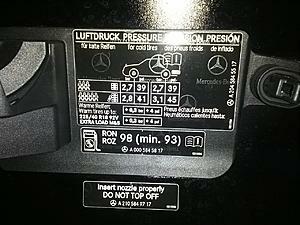 At the track, you must have a tire pyrometer to properly set tire pressures. The trick is to drive the car then quickly check the temperature of each tire (use the stick-in probe, not the IR laser) at the outside edge, middle, and inside edge. Average the outside and inside edge temperatures; if the middle temp is lower, then the tire is under inflated. If the middle temp is higher, then the tire is over inflated. You'll notice that often the inside and outside edges of the tires have different temperatures. If the inside is running hotter than the outside, then you have too much negative camber and you need to dial it out. If the outside is hotter, then there's not enough caster and in corners the tire is rolling over. Good luck on this, though, as I don't believe camber is adjustable on the W204.